One of the finest draftsmen ever to work at the Walt Disney Studio, Marc Davis has become a legend in our time. Born in 1913 in Bakersfield, California, he was one of the "Nine Old Men" whom Walt Disney gathered around him in the 1930s to develop the new art of animation. Marc Davis passed away January 12, 2000. 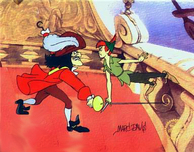 Marc Davis was a key animator at Disney for forty-two years. For seventeen of those years, Marc Davis taught advanced classes in drawing at Chouinard Art Institute in Los Angeles. Marc Davis's work has delighted audiences and influenced two generations of animators. At Disney, Marc Davis gave life to Disney heroines such as Snow White, Alice of Alice in Wonderland and Cinderella. Noted for his brilliant female characters, Marc Davis created Tinker Bell, Sleeping Beauty's Maleficent, and Cruella DeVil of 101 Dalmatians . Marc Davis also helped to design Disney theme park attractions, including Pirates of the Caribbean, The Haunted Mansion, and Small World. The Academy of Motion Picture Arts and Sciences has honored Marc Davis by sponsoring the annual Marc Davis Animation Lecture Series, which each year features a world-famous animator. Remember every time you purchase a Marc Davis artwork over $995, shipping is FREE in the continental U.S. and there is NO SALES TAX when you purchase outside of Colorado. We SHIP WORLDWIDE and offer Layaway for Marc Davis art.